Which baby carrier is easiest to put on? Find out Here! Which baby carrier is easiest to put on? There are a few considerations to be made when asking which baby carrier is easiest to put on, it is a question we are asked regularly and our answer will depend on a few factors. I find any baby carrier easy to put on, but I have a good range of movement and can easily reach my shoulder blades from above and below with both arms. I know lots of parents who would struggle with this movement so my response to them asking the question would be a little different. In essence, though, most baby carriers require you to be able to buckle two to three clips, that’s it. Some people can still find this awkward and difficult so when working with parents in the shop we like to let them practice using a weighted doll before trying with their own baby, at home you could use a teddy bear. We often get asked why we use a doll to practice, parents ask are baby carriers safe? We find it is best to practice with a doll until parents are comfortable in the movements they make to put the carrier on, as if they are stressed and unconfident it can upset their baby if they practice using them. Most baby carriers have a waistband which buckles at the hip or middle of the back. The majority of people find it easiest to buckle at the hip where they can see the clip. Once this clip is fastened, the baby is placed in the carrier and the shoulder straps can be fastened. This is usually where the range of motion and confidence can play a factor in how easy you perceive a carrier to be to fasten. Some carriers have straps which are fixed to the sides of the carrier, some have straps that can be unclipped, this means that some can only be worn with straight straps (e.g. Tula) while some can be worn either with straight straps or cross straps. When a carrier is worn with straight straps there is usually a connecting strap between the two shoulder straps to prevent them from slipping down the shoulders. This can be more difficult for someone with limited range of movement as you need to be able to reach behind your head. Though if you can reach to put your hair in a ponytail then you should be able to clip this buckle together, it can be a little awkward at first, but after a couple of times, it becomes second nature. If this range of movement isn’t possible we would suggest a carrier that allows you to cross the straps (e.g. a Lillebaby Complete or a Connecta). With this type of fastening the user just needs to be able to slide their arm along their lumbar region to the other side of their back and bring the strap to the buckle at the side of the carrier. 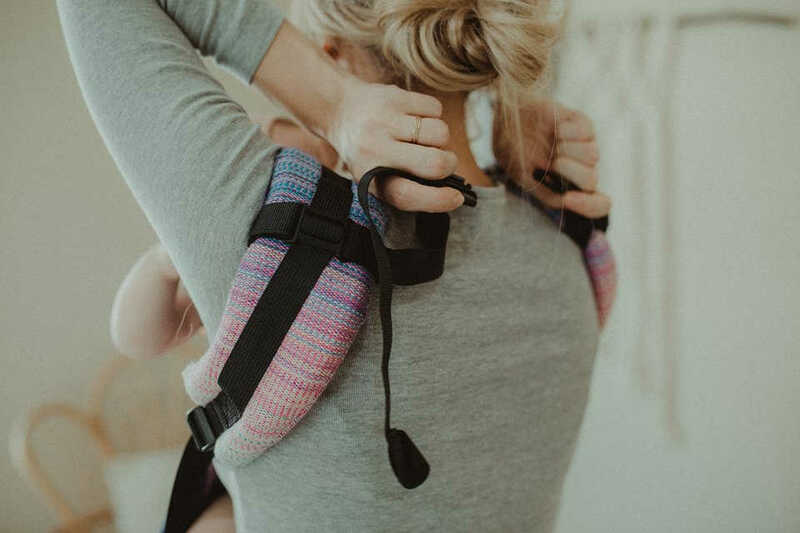 When considering which baby carrier is easiest to put on it can be helpful to know whether the straps can be worn straight only, like Tula, crossed only, like Connecta, or both, like the Lillebaby Complete. Remember, it is only easy if you are confident in what you’re doing, so practicing can be really helpful, a mirror can be useful, to begin with. Read More: Which Baby Carrier is the Best?